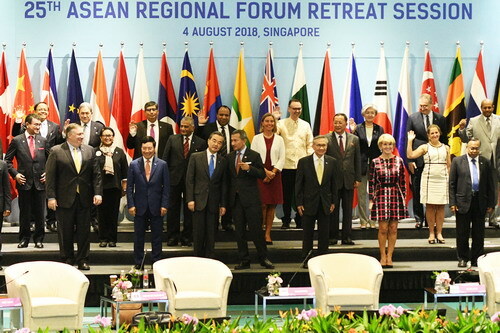 On August 4, 2018, State Councilor and Foreign Minister Wang Yi attended the 25th Association of Southeast Asian Nations (ASEAN) Regional Forum Foreign Ministers' Meeting held in Singapore. Wang Yi expressed that the most positive progress in the current situation in East Asia is that the Korean Peninsula nuclear issue has returned to the track of settlement through dialogue and consultation. The Chinese side is pleased with and firmly supports it. Wang Yi said that with the joint efforts of China and the ASEAN countries, the situation in the South China Sea has been further stabilizing and the negotiation on the Code of Conduct in the South China Sea jointly advanced by China and the ASEAN has achieved new important progress recently. At the same time, we also see that unilateralism and protectionism are eroding the prospects for development and prosperity in the region and the global free trade system is being severely affected. It should also be pointed out that some countries outside the region willfully show off their military power in the South China Sea, thus becoming the biggest driving force behind the regional militarization. Wang Yi expressed that the Cold War mentality and the coercion by force go against the trend of the times, and unilateralism and protectionism cannot solve any problem. 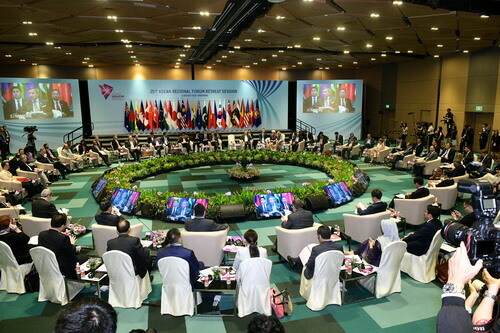 Regional countries should unite and cooperate with each other, resolutely support free trade, oppose protectionism, and uphold the process of multilateralism. It is hoped that countries outside the region will respect the efforts and progress made by regional countries in safeguarding peace and stability, and play a constructive role in the peace and stability of the region. The meeting adopted a statement of cooperation on disaster management initiated by China.